On the 20th July 2013 myself Daveswildcamping my friends John and Paul headed to the Lake District near the town of Grasmere to a miniature hill call Helm Crag. See my video below the photos to see what happens. The geology of the fell is complex, but the summit is in an area of outcropping andesite sill. There is no history of mining. The 'Old Woman playing the Organ' rocks. At either end of the highest ridge are the rock outcrops that ensure Helm Crag's fame. Only one can be seen from any point in the surrounding valleys, and they have a variety of names depending upon the profile seen from the particular vantage point. The northwestern outcrop is the true summit of the fell, a tricky little scramble being needed to stand on the top. 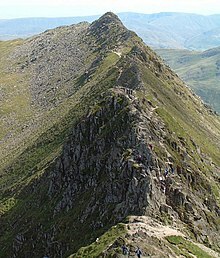 It is variously called 'The old lady playing the organ' when seen from Mill Gill, 'The howitzer' from the summit of Dunmail Raise and 'The lion and the lamb' or 'The lion couchant' from a point in between. The southern outcrop is prominent from Grasmere and this is the traditional 'Lion and the lamb'. On the 13th July 2013 Me and Paul left home to head to the lake District to hike and Wildcamp on the Old Man of Coniston. We stayed up all night to the most amazing cloud inversion we’ve seen to date. Watch the video below for our story. "It is one of the great favourites, a family fell where grandmothers and infants can climb the heights together, a place beloved. Its popularity is well deserved, its shapely topknott attracts the eye offering a steep but obviously simple scramble." The fell's unusual name may well have come from a distortion of "Cat Bields" meaning shelter of the wild cat, although this is not certain. The fell's name is sometimes written as Cat Bells and is so printed on some maps. Catbells is the last fell on the ridge separating Derwent Water from the Newlands valley. It rises due south from Hawse End, reaching the summit in two distinct steps. The lower top is named Skelgill Bank. Beyond the summit of Catbells is the steep sided depression of Hause Gate, before the ridge broadens and twists south westward to Maiden Moor. The Catbells ridge is an example of the Buttermere Formation, an olistostrome of disrupted, sheared and folded mudstone, siltstone and sandstone. Nearly all ascents of Catbells start from Hawse End at the foot of the northern ridge; there is car parking here but the spaces soon get taken on busy summer days. Hawse End is also served by the Derwent Water Motor Launch and this enables visitors to Keswick to combine a sail on the lake with an ascent of the fell. Many walkers who reach the top of Catbells return to their starting point after admiring the view, however, strong walkers can continue along the ridge to take in the fells of Maiden Moor, High Spy, Dale Head, Hindscarth and Robinson to give a horseshoe walk which ends in the Newlands valley close to Hawse End. The summit is all rock with many loose stones lying amid the small outcrops. The view from the top of Catbells gives a fine panorama which is dominated by the aerial view of Derwentwater. Bassenthwaite Lake, the Newlands Valley, Skiddaw and Keswick all show well to the north, while the view south has a fine vista of Borrowdale. A 360 degree view from the summit of Catbells. The view North of the summit (middle of the image) takes in Skiddaw, Blencathra and Keswick on the edge of Derwentwater. Although Catbells is renowned as a "family fell" it does have some dangers especially from the disused lead mines on its slopes. The Yewthwaite mine, which is on the western side of the fell has extensive spoil heaps and shafts. Many of the shafts were previously open and dangerous but most have now been blocked off. The Brandlehow and Old Brandley Mine worked a lode for lead ore on the Derwent Water (eastern) side of the fell. All three mines ceased production in the 1890s. On the lower slopes of the fell above Derwent Water stands Brackenburn Lodge, now holiday accommodation but formerly the home of Hugh Walpole who wrote the Herries series of books when he lived here from 1924 to his death in 1941. All photos and video is taken on my mobile because I forgot to charge my Nikon D3200 battery due to not enough planning and work commitments. On the 1st of September 2012 myself Paul “themuss” met our friend Paul “Kilburnicus” in the lake district near Ullswater, we set off on a short direct route that would take us straight to Hallin Fell summit to be greeted with some great views of the lake. I was the first to get my bivvy pitched but last to get sorted thumbing around with various ways to put my tarp I ended up with the help of the two lads and we came up with what you see in the below photos, I’m gonna need some serious experimentation with configurations before this will be come a practical way of life for me. For lunch I had two boil in the bags washed down with a brew of yorkshire tea followed by a single can of special brew lager, Paul had his usual brandy which I believe might have been the cause of what made him retire first whilst me and Killburnicus chatted into the early hours about our next meet up in the Scottish highlands, over the top of the sound of loud snoring by themuss. View of Ullswater from the trig point. A great night was had by all of us watch my video below. Hallin Fell is a hill in the English Lake District surrounded on three sides by Ullswater. The fell is a continuation of the ridge leading down from Steel Knotts, but the depression at The Coombs is so profound that Hallin Fell appears totally independent in almost any view. This is born out by its status as a Marilyn, despite being diminutive amongst Lakeland fells. Hallin Fell stands like a plug in the outlet of the Martindale valley system. The outflows of Rampsgill, Bannerdale and Boredale are deflected west around the fell, eventually finding the shore of Ullswater at Sandwick. Fusedale and the little valley above Howtown drain around the east of the fell to meet the Lake at Howtown Wyke. The southern boundaries of the fell are therefore easily defined by these watercourses and the Howtown to Sandwick road with its ferocious hairpin climb to The Coombs. The fell is circular in plan with smooth slopes to the south and west. Wainwright famously claimed that the southern side could be "ascended comfortably in bare feet". There is rougher ground on the other sides and Hallin Fell's northernmost extremity — Geordie's Crag — projects into the lake, separating Ullswater's middle and lower reaches. The top is grassy with a number of small knolls and some outcropping rock. The highest point has an imposing square sectioned columnar cairn, and there are many other small cairns at other vantage points. Like many shorter hills in mountainous areas, the views from the summit are excellent, and Hallin Fell commands views across Martindale Common, High Street, Helvellyn, Blencathra and Ullswater. View southwest over Martindale from Hallin Fell with captioned fell names. Ullswater can be seen on the right of the picture. The climb from Howtown to the obelisk at the summit is short and easy, there are also multiple paths up from St Peter's church at the hause and from Howtown hamlet. Around the northern side of the fell is part of the popular lakeside walk from Howtown to Patterdale. This route, mainly in wooded surroundings and with some gentle scrambling over outcrops, can be combined with a trip on the Ullswater steamer to provide a fine low-level excursion. On the 17th May 2012 myself Paul themuss Daniel Export Sales Rep for Hilleberg the TentMakers and a group of lads from George Fisher the Outdoor equipment shop whom are great retailer for Hilleberg Tents and other outdoor gear, we all met at a Campsite in the Lake District (after the Keswick Mountain Festival had been on up the road) to have a bit of crack, some booze and some food and stay the night in some Hilleberg Tents. Me and Paul arrived at Keswich in the Lake District had around 4pm ish and drove onto the Stonewaithe Campsite (it was raining as usual for the area) to be greeted by a lone man in his tent we sat there for a bit wondering if this was Daniel or someone from George Fisher maybe, on asking him he said he hadnt herd of Hilleberg and new nothin about our meeting which we were invited to. So off we went to seekout some info at the nearest pub called The LangStrath Country Inn which whilst we were there we thought we would checkout the local Ale we asked some questions if anyone had known about a meeting with Hilleberg and George Fisher on the campsite just a few hundred yards down the rather bumpy road, knowone had herd anything, me and Paul were a little unsure what to expect here would there be Marquee tents serving mountains of food and beer with hundreds of people here ? we even considered the email we received to be a windup lol. With some phoning around from a very helpful woman in the pub whom put our minds to rest and said it was all true and soon enough a silver car past the pub window and she said he was waiting for us on the campsite. So after just one pint of the fine Ale we walked over to be greeted by Daniel a very charming Scandinavia guy whom works in Export Sales for Hilleberg the famous tent makers this was something I was very looking forward to and couldnt be missed as I have been a fan of there tents for many years as my videos will show. We started by errecting some of the tents Daniel had brought a long opened some cans of lager he had with him and soon after three lads from George Fisher had turned up. We all had a wander around these fabulous tents whilst Daniel gave us a run down on them and explained how one person is involved with the full manufacture of each tent and their name is place on a tag inside the tent that they have made. I found this astonishing as I have never noticed this on my old Akto and checked it when I got home and sure enough a name was on the tag “Helviina Saar” as you can see from my video, I really find this amazing as I no the care these people will take in making these tents as not only because there name is on but the sense of pride each individual would feel after being solely involved in making a product that will be used and cherished by someone on the other side of the world for many years, how satisfying that must feel. After some cans of lager and a nice baracue and some more chat we decided to call it a night around 23:00 two of the members of our group couldn’t spend the night so we were down to just the four of us myself Paul, Daniel and Jon I had my usual poor sleep no fault of the great roomy tent I spent the night in which was the Nammatj 2 made from the Kerlon 1800 which is currently the strongest fabric used in Hilleberg tents and has the stronger 10mm Dac poles this is a tent I will be considering in the near future. On my way up Great Mell Fell in the Lake District Cumbria North West England today 12th September 2011( this blog is live as usual) with my mate Paul aka the muss. I picked this location as its west from our home town and Paul has been screaming to test his Vango Hurricane out in storm force conditions and my have I an evening in store for him and he tells me he wants a small hill as his fitness is not too good. Tell you the truth if one of our tents has to blow away I am half hoping its mine as his been a two-man tent and mine been a tight single man tent I don’t fancy been squished in mine with him, his breath stinking of brandy and his snoring not to mention his smelly backside. Heres what happened, We new what we were letting ourselves in for catching the tail end of hurricane Katia blown in from the States. The purpose of this Wild Camp was to test Pauls Vango Hurricane and by god we did. I arrived at Pauls at 12.10pm we finally were on our way after Paul packed some of his gear and arrived at our destination around 3pm. I was keep saying how lovely this hill is the wind blowing the grass and patches of trees scattered it look very idealic. At first the wind didn’t appear very strong at all then by we were half way up we recorded around 63mph on Pauls Kestrel wind gauge. It was tuff standing up sometimes having to spread one leg out behind us to keep the wind from sweeping us off our feet, I have never experienced winds so powerful. We reached the summit of Great Mell Fell not a big Hill by anyone’s standards, we stood there for a while pondering what to do, do we go for it and pitch on the top or head down in a more sheltered spot, we headed back down and after deciding the lower location lost views over at least one direction we headed back to the top. I proceed to pitch the Hilleberg Akto with Paul sitting on the flysheet whilst I pegged down the corners, standing watching my poor Akto get battered we recorded 79.1 mph as you will see in my video. We then started working on the Vango Hurrricane, when he pulled all these poles out of his bag I thought to myself no way on earth this is going up, frantically holding onto the canvass, a few bent poles later we gave up never even raising it off the floor we decided to head to lower ground to pitch leaving my Akto up on the summit with my Osprey Argon inside we headed down. On discovering a snapped pole Paul discussed sleeping in the car I would have quite happily slept in my tent having the walkie talkies with us we could have at least kept in touch, I thought that wouldn’t be fair so we set off back to the summit took down the Akto and headed home. Both very sick by this time, our first Wildcamp we have had to leave for home. Anyone reading this may think Paul is a little unlucky, well I think he’s not, for someone to lose a piece of gear a Satmap in this case, standing him at £400 with SD card for him to return the next day 200 miles round trip to find three cars parked in the very spot he lost it with a note on one of them asking him to contact them for a lost piece of hiking equipment. Paul I bet your relieved. Just came across this forum members having a bit of a giggle at this blog post. Great Mell Fell is a hill in the Eastern Fells of the English Lake District. It is a north-eastern outlier of the Helvellyn range, but, like its twin Little Mell Fell, is isolated from its fellows, standing in the middle of a flat plain. Presenting a symmetrical domed profile from almost all aspects, Great Mell Fell conspires to appear almost artificial, akin to jelly turned out of a giant mould. The hill lies on a low ridge, barely perceptible in places, which provides the connection between the Northern and Eastern Fells. This watershed runs from Bowscale Fell, across Eycott Hill to Great Mell Fell, and then up the north eastern ridge of Great Dodd. It forms the boundary between the Derwent/Cocker system in the west and the wide catchment of the Eden Valley. To the north west of the fell is an old rifle range, now disused but still with some fittings in evidence. This was once a reason to declare Great Mell Fell strictly off limits, but this is not the case nowadays and the fell is free land. The National Trust currently owns the fell above the fenceline. Great Mell Fell is extensively planted with Scots pines on the east, and occasional trees dot the fell all around the base. Near the summit are a few stunted larches, blown almost horizontal by the prevailing winds. The summit bears a small cairn built on top of a mound. The Ordnance Survey maps identify this as a tumulus and it is believed to have been a Bronze Age burial mound. Due to its isolation from higher ground, Great Mell Fell is a Marilyn, and an excellent viewpoint. The fell can be climbed most easily via a path from Brownrigg Farm to the south east, and additional access can be gained through the old rifle range. There is also a footpath which circles the base of the fell, passing largely through woods and providing an enjoyable low level walk. 14th July 2011 I set off from my house about 12.30pm for a Wild Camp alone on Dale Head Summit In the Lake District, it took about 2 hours 30 mins to get to my destination going the scenic route I got stuck behind slow traffic, I parked about a half mile down the road from the Honister Slate Mine on the Honister Pass just outside of Seatoller. After the steep walk up the road opposite the slate mine was the start of my path up to Dale Head summit, I reset my satmap at 15:02 and off I went as you can see from my satmap screens it took me 1 hour 18 mins total time and 50 mins time moving which means I only had about 30 mins of stops which is good for me lol. On reaching the summit I had a walk around to find the best pitch for my Hilleberg Akto I setup my Mrs Dragonfly Stove for a cup of yorkshire tea then decided to have a walk over to Dalehead Crags there was a nice spot there for my tent with a nice view over Buttermere Lake, Crummock Water wasnt visable from here, after another brew of yorkshire tea I decided to head back to the summit of Dale Head as am a sucker for the summits even though the options maybe the more sensible at times. After taking some video footage out came the Akto it pitched ok with only a slight breeze it was time for another brew of tea and then out came my steak for cooking as I was just awaiting the sunset which turned out a little disapointing blocked by a band of low cloud just above the horizon. My phone signal was very patchy the best signal was over Dalehead Crags so decided to head back over there leaving the tent my backpack, tripod with my video camera on and head over to try and post on my liveblog and read my fans posts. The moon came out first looking very orange which a captured on my video camera and later became covered at times in patchy cloud. I really enjoyed my night in total solitude alone on a hill without any rain with lovely views. Morning came I must have had about an hours sleep I had my alarm set for 4.30am for the sunrise but was awake before it went off, the sunrise was hampered by low cloud but when the sun appeared it was a great sight lighting the sky red, in the distance over towards scafell Pike and great Gable there appeared to be a cloud inversion happening and the conditions at first appeared just right, the cloud was hugging the hills as a gentle breeze in my direction slowly brought it my way but after hanging around a few hours for it to surround my hill it didnt materialise how I was wishing. I packed my tent away and was off back down the hill at 6.50am it only took 39mins total moving time and only a two min break back to the car. Dale Head is a fell in the northwestern sector of the Lake District, in northern England. It is 753 metres or 2,470 feet above sea level and stands immediately north of Honister Pass, the road between Borrowdale and Buttermere. The North Western Fells occupy the area between the rivers Derwent and Cocker, a broadly oval swathe of hilly country, elongated on a north-south axis. Two roads cross from east to west, dividing the fells into three convenient groups. Dale Head is the highest fell in the southern sector. Dale Head is the apex of two hill ridges. The principal ridge descends from Dale Head to the north-east and forms several other fells, each given a chapter by Alfred Wainwright in his Pictorial Guides to the Lakeland Fells. These are High Spy, Maiden Moor and Catbells (alternative spelling, Cat Bells). This ridge forms the western side of Borrowdale and overlooks Derwent Water. The other ridge descends to the north-west and includes the fells of Hindscarth and Robinson; it overlooks Gatescarthdale and Buttermere. Dale Head is named for its position at the head of the Newlands Valley. This stretches away due north for three and a half miles before debouching into the floodplain of the Derwent between Derwentwater and Bassenthwaite Lake. The eastern wall of the valley is formed by the High Spy to Catbells ridge, separating it from Borrowdale. Entering on the western side are a series of side valleys which drain the main mass of the North Western Fells. The source of Newlands Beck does not however flow from the apex of Dale Head as might be supposed from the name. Instead it has its birth at the col between the main summit and the eastern top, High Scawdel (1,815 ft). The northern face of the fell forming the dalehead is ringed with crags. The main faces are Dalehead Crags and Great Gable, not to be confused with the fell of that name. The southern flank of the fell running down to the summit of the Honister Pass road (1,180 ft) has much gentler slopes, although there is outcropping rock on either side. Buckstone Hows and Yew Crag overshadow the road.From the top of the pass Gatesgarthdale Beck runs north west to Buttermere while Hause Gill flows east to Seatoller and Borrowdale. Across the road is Grey Knotts in the Western Fells. The ridge to Hindscarth departs north west from the summit of Dale Head, soon narrowing into the fine and airy Hindscarth Edge. Both slopes are rocky, that to the south being known as Molds. Far Tongue Gill descends from the north of the ridge, a tributary of Newlands Beck. Although High Scawdel stands east of the main summit, the high ground takes a great loop to the south around the head of Newlands Beck. It then drives north to the depression at Wilson's Bield (1,655 ft) before climbing to the summit of High Spy. The rest of the North Western Fells bear no tarns worthy of the name, but Dale Head has two. On the northern slope near the source of Newlands Beck is Dalehead Tarn, while the smaller Launchy Tarn lies near the top of High Scawdel. Dalehead Tarn is a shallow pool providing a popular stopping place for walkers. Its varied flora include water horsetail, sedge and bogbean. Launchy Tarn is smaller and may have been formed by overgrazing and erosion of the underlying peat. Dale Head stands at the junction of the two main Lakeland geological systems, the Skiddaw slates to the north and the Borrowdale Volcanics to the south. On the northern flanks are outcrops of the Buttermere Formation, olistostrome of disrupted sheared mudstone, siltstone and sandstone. Southward march the Borrowdale series beginning with the plagioclase-phyric andesite lavas of the Birker Fell Formation, visible near the summit. The fell has seen extensive mining history. Dale Head Mine was driven below the northern crags for copper, several levels still being visible. Long Work was another copper mine a little further down the valley, worked for malachite and pyrite from Elizabethan times. On the southern flank of the fell, centred around the head of the pass, are the Honister Quarries. These are an extensive system of underground quarries, worked for Green Slate. The earliest extant records date from 1728 and since then huge caverns have been carved out on either side of the pass. The Yew Crag workings on the Dale Head side were operated until 1966, operations on the slopes of Grey Knotts continuing. In 1887 work began to drive a tunnel right under Dale Head into Newlands Valley, connecting with a proposed tramway to join the railway at Keswick. The scheme was abandoned after opposition from landowners. The main workers accommodation at the mine is now the Honister Hause Youth Hostel. The view of the Newlands Valley and Skiddaw from Dale Head summit cairn . The summit is marked by a cairn standing on the brink of the northern face. There is a fine end-on view of the Newlands Valley to the north, backed by Skiddaw. All around are rank upon rank of fells, of the major Lakeland ranges only the High Street group not being fully visible. One of the most popular ascent routes of Dale Head begins from the summit of Honister Pass, where there is a car park and a youth hostel. The route ascends directly alongside a fence for approximately 2 kilometres and would take the average walker some 45 or 50 minutes. Longer routes begin at Little Town in the Newlands Valley, climbing either via Dalehead Tarn or the old access track to Dale Head Mine. From Borrowdale a start can be made at either Seatoller or Longthwaite, ascending first to Launchy Tarn and High Scawdel. 3rd Jan 2011 myself and Paul parked up somewhere in Ennerdale valley to hike Pillar and camp on the summit, I planned the location to park the car as less of a hike to the summit, but little did we realise the road was private so we had to leave the car a few miles future away than planned which meant when we set off on foot it ended up much later than we had anticipated. Off we started hiking and we ended up pitching our tents well short of the summit as darkness was creeping in and agreed we wouldn’t reach the summit with the time we had left, so we pitched on a windy hole called Windy Gap little did we realise at the time. There was no snow when we put down our tents but I was outside at around 3am replacing a peg in my guy wire and there was a canny covering horizontal snow hitting my face like needles, after awaking to snow inside my tent from leaving the top of the door open and my end vents open more than likely what else could go wrong well forgetting to fill up my fuel bottle before i left home and the horrible taste of washing up liquid in my drinking water it was a typical wildcamp for me. Pillar from the east. Pillar Rock is clearly visible on the skyline on the right. Pillar is a mountain in the western part of the English Lake District. Situated between the valleys of Ennerdale to the north and Wasdale to the south, it is the highest point of the Pillar group (some dozen fells clustered round it). 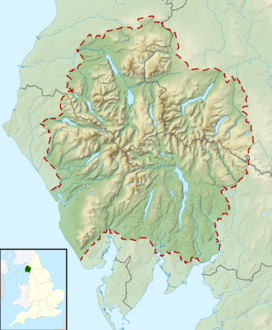 At 892 metres (2,927 feet) it is the eighth highest mountain in the Lake District. The fell takes its name from Pillar Rock, a prominent feature on the Ennerdale side, regarded as the birthplace of rock climbing in the district. The summit of Pillar is at the western end, immediately above the descent to Wind Gap (2,475 ft). This continues the watershed to Scoat Fell and beyond. A subsidiary spur branches off north west of the summit, passing over White Pike before petering out in the Ennerdale Forest. The eastern ridge of Pillar stretches for about a mile, gradually descending before the final upthrust of Looking Stead. This subsidiary top is listed as a Nuttall in its own right. Beyond is Black Sail Pass, a pedestrian route between Wasdale and the head of Ennerdale. Kirk Fell stands on the other side of the pass. Pillar is usually climbed from Wasdale Head, by far the nearest road access. The simplest route involves taking the Black Sail Pass, the main foot pass between Wasdale and Ennerdale, to its highest point (around 545 metres), then ascending the mountain's relatively gentle east ridge. Greater interest may be obtained by branching off the ridge (at c. 640 m) onto the "High Level Route", a narrow path which traverses around Pillar's northern crags before approaching the summit from the north, affording good views of Pillar Rock. 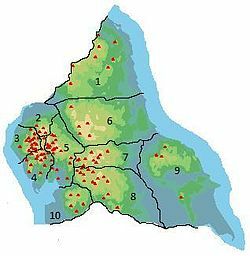 Many walkers based in Wasdale climb Pillar as part of the Mosedale Horseshoe, a circuit of the skyline one of Wasdale's side valleys, which also includes Scoat Fell, Red Pike and Yewbarrow; Kirk Fell may also optionally be included. Pillar may also be climbed from Ennerdale. From the YHA youth hostel at Black Sail at the head of the valley, it is a fairly short walk (around 1.5 km and 300 m of ascent) to the summit of Black Sail Pass, from where the same routes can be followed as described above. As Black Sail hostel is five or six miles from the nearest public road, this approach is somewhat impractical to day-trippers (especially since the Ennerdale valley is itself remote from the main tourist centres of the Lake District), though attractive to those staying at the hostel. Alternatively, there are various paths up the mountain from lower down the valley which offer the possibility of closer acquaintance with the crags of the north face. It is not unfeasible for strong walkers to approach Pillar from the Buttermere valley, which has the advantage of being more accessible than Wasdale from major tourist centres such as Keswick. It is first necessary to ascend and descend the Scarth Gap Pass between Gatesgarth and Black Sail, which then allows an ascent via Black Sail Pass as detailed above. The walk from Gatesgarth to the summit of Pillar and back involves over 1,200 metres (4,000 feet) of ascent, more if the High Level Route is taken. Pillar Rock has a topographic prominence of more than 15 metres, and thus qualifies for the list of "Nuttalls" compiled by John and Anne Nuttall in their book The Mountains of England and Wales (see also Hill lists in the British Isles). It is the only summit on the list that cannot be reached without recourse to rock climbing. ^ a b c H.M Kelly & J.H.Doughty. "A Short History of Lakeland Climbing, Part 1", Fell & Rock Climbing Club Journal, 1936-37. Accessed 17 November 2006. ^ Stephen Reid. "Rock Climbing in Wild Ennerdale". Accessed 17 November 2006. ^ UKClimbing.com Databases – "Pillar Rock". Accessed 29 September 2007. ^ John & Anne Nuttall (1990). The Mountains of England & Wales - Volume 2: England (2nd edition ed.). Milnthorpe, Cumbria: Cicerone. ISBN 1-85284-037-4. On the 15th Feb 2011 me and my mate Paul (read his account of our trip) set off from Buttermere in the Lake District heading up to Warnscale Head Bothy, this nice little bothy is barely visible until you are right on top of it. On trying to find the Bothy Paul whom had been here before took me up the wrong face and left me on the side of the mountain whilst exploring further ahead, I looked another direction thinking this place is bloody hard to find, like looking for a needle in a haystack. I was about to give this up as a bad job weather crap soaking wet and we didn’t have much daylight left to find the place, we decided to look up the other face and there it was what a relief. On approaching the bothy I was praying we were the only ones there with this idea. Opening the door we were welcomed to a small room with three wide bunks down the walls, a fireplace and a visitors book to fill in. We proceeded to light the fire with the mountain of sticks and firelogs we had carried up, to make it catch a little better I threw on a little petrol out of my dragonfly stove bottle, it became apparent almost immediately that this is going to be a smokey night we were almost overcome by smoke on many occasion and that was about to get worse when Paul fired his barbecue up inside as it was still raining outside and it didn’t help when I knocked it over and had to run out for air leaving Paul to pick up the hot embers. We were getting rather settled by this time jackets and trousers off drying over the fire and boots melting in the fireplace literally, our steaks cooking on the barby, I could go on ages talking about this night as its rare getting a good soaking and being able to dry your duds over a fire a luxury you don’t normally have in a tent. On leaving the bothy in the morning we hiked up to Fleetwith Pike Summit to some great rare weather and nice views, a good day had by both of us. Powered by WordPress v 4.7.13. Page in 1.106 seconds.